thrones_this has prolly been asked but when in mm/casual my chat doesn't go where i moved it to in Basechat.res? are you talking about the overheal / low health cross? Smesi PwnEdhow to edit overheal radius? are you talking about the overheal / low health cross? XenThePybrohow do i edit the disgusting main menu background on this? Tried MatchmakingGroupPanel & MatchmakingCategoryPanel yet? are you talking about the [url=https://i.gyazo.com/9208906155ed29b431f097f138ba9489.png]overheal / low health cross[/url]? ------ XenThePybrohow do i edit the disgusting main menu background on this? Tried MatchmakingGroupPanel & MatchmakingCategoryPanel yet? I can't find it in MatchmakingGroupPanel, MatchmakingCatagoryPanel, LobbyPanel and LobbyPanel_Casual. 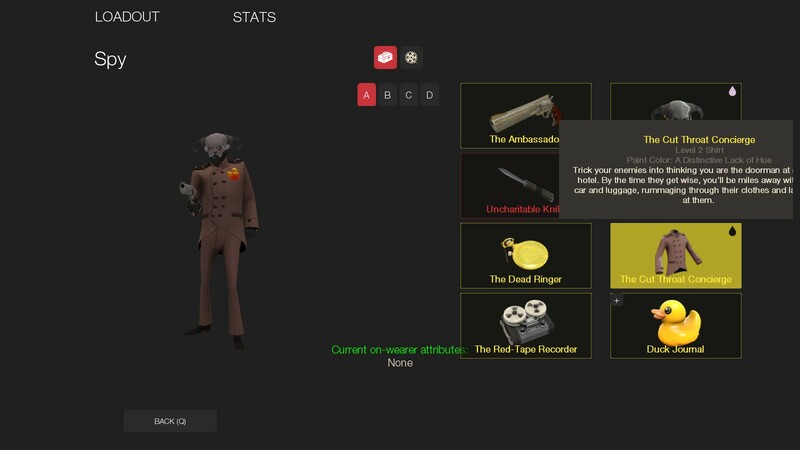 XenThePybro I can't find it in MatchmakingGroupPanel, MatchmakingCatagoryPanel, LobbyPanel and LobbyPanel_Casual. It is in matchmakinggrouppanel.res, "BGPanel". I'm fairly certain it is not one of those random, stubborn HUD elements, so you can do what you want to it. is it possible to edit the vote menu e.g. votekicking someone in a pub? XenThePybrois it possible to edit the vote menu e.g. votekicking someone in a pub? And also why does my font look weird? And also why does my font look wierd? mouseoveritempanel in classloadoutpanel.res, try working with that. sometimes after a round of casual the new overlay's buttons dont work. I tested this with the stock hud and it appears to happen with that as well. Anyone have any ideas? im on a mac maybe thats why. I'm using Lawena's hud_killnotices HUD, while should display only the killfeed, but I'm having the PLR progress pop up. Any help? In objectivestatusmultipleescort.res (if you don't have it extract it from default hud files and put it in resource/ui) try to set everything that has enabled or visible to 0, if this doesn't suceed try changing xpos or ypos to some ridiclous number like 9999999 or something. What do I do to implement the Knuckles Crosses into rayshud? shinsoWhat do I do to implement the Knuckles Crosses into rayshud? [quote=shinso]What do I do to implement the Knuckles Crosses into rayshud? Cubekol shinsoWhat do I do to implement the Knuckles Crosses into rayshud? [quote=Cubekol][quote=shinso]What do I do to implement the Knuckles Crosses into rayshud? does anyone know why there is a black line above my stream panel? I cant find anything. Also, how can I correct this? Also, how can I correct [url=https://gyazo.com/5c448aa3e64801901a3de307e376a612]this[/url]? KonceptAny idea what font this is? if there is a tf_english in your hud folder, delete it. Otherwise restart tf2 and it should be fixed. [quote=Koncept]Any idea what font this is? Someone tell me about buttons_kv. I saw wiethoofd (did i spell it right?) talk about it and i found some stuff related to it in mainmenuoverride.res and i hear that it can be used for lazy dudes to make easy buttons. Copy the texture files stoge? WiethoofdCopy the texture files stoge? I have no idea which ones he's using. Where is it declared and in what files? is it possible to use buttons_kv to make horizontal button arrangements? Is there an easy way to make longshadows apart from layering the same text over and over itself?